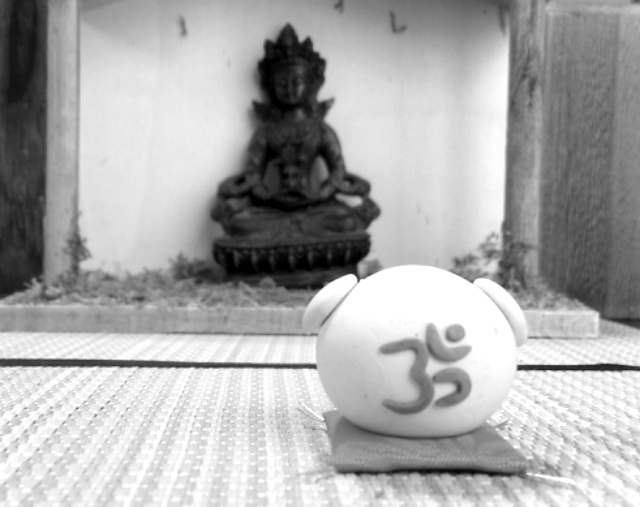 Zen Piggy Meditating in front of Buddha in Sacred Japanese Tatami Room. Daily Meditation is good for you. You don’t know what is the point of meditating? Meditation helps reduce stress, helps us to focus, help us to relax that promotes various health effects and just so much more. So how to meditate? Just sit in relax position. Don’t even have to worry about sitting on the floor like typical meditation image. Just sit down and relax. close your eyes and visualize you are in somewhere very very relaxing and makes you happy, make sure that location is somewhere nature. like, imagine you are by the beach in the tropical ocean… or you are sitting by the cliff in Grand Canyon… wherever you like! Just keep visualizing, relax, and feel the sensation just like you really are in the special location. Imagine all your stress goes away, you feel so relaxed, wind, sound, scents, everything washes your stress away. If your busy mind start distract your meditation, try to keep focusing on visualizing you are in the beautiful nature location. At least for about 10 minutes, just keep feeling your relaxation and that is the start! Practice this as often as you can. Then maybe you can go to the next step of meditation. But just doing this will bring all the benefit. The more you do, the more you will see why. Once you get it, you will not want to stop meditating. Piggy knows it. So he meditate everyday. Burn incident. My personal story and What to do when you have injury from burn. Today, I want to talk about BURNS. Everyday, we use household items that could cause burn injury. 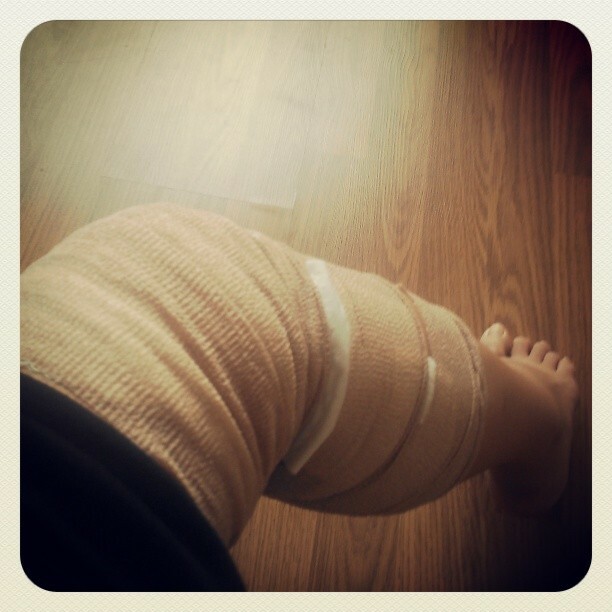 The other day, I burned my leg badly by spilling hot water on my leg. I had prepared hot water for my tea and I put hot water in my thermos so I can enjoy hot tea when I am out. I was hurry and careless. I did not make sure the lid of thermos was tightly closed. Then sure enough, when I got in the car, I tilted my thermos and spilled hot water on my right leg from around my knee to lower calf. Quick second, I felt sharp pain and extremely hot on my leg, I jump out the car and still so hot I realized hot water on my clothes is touching my skin and keep burning. I iced my leg immediately and since I was on my way to my important class that was all day length, I left to my class anyway with ice on my leg. As I arrived, my leg was red and I saw slight loose skin on surface. I kept icepack on my leg and spent my morning class. Lunch time, I looked at my leg, I saw blisters glowing up in huge area on my leg. In my thoughts… “Ew…(talking to myself.lol) What do I do! ?” but still, my mind is to finish taking my class for the day, so I went to afternoon session of this class. By the evening, blisters grow and more numbers. I had two huge blisters at least 3inches long each and multiple small ones and dark red all on my right leg. I stayed at first ER about one hour, then they sent me to the different ER with specialist and plastic surgeon. Then I spent another 6 hours at the second ER. I had IV, shot and treatment at ER. Then I had spoken to Plastic surgeon to see if I needed any special attention because my burn was just around my knee. Anytime burn happen, if If the burned region is larger than 3 inches, or has occurred on your face, hands, feet, groin, buttocks, or a major joint, we should have professional care. I am natural thinking person and going to hospitals is my last option. So I was not planning to go to Hospital. But I did researched well about the burn and I have discussed with my friend who has medical knowledge and I showed my burn, he told me to run to ER right then. It is not about knowing how to do home treatment, but the danger of infection because of this burn because my burn was so severe. I might be one of the rare person who was denying to go to the hospital when my leg in such wide area was really burnt and had gian size blisters all over it. As I see my leg’s condition is worsen every minute, after I picked up my son after my class, I went home and my husband immediately took me to Hospital. Everyone’s reaction was not good. It looked so bad nurses cannot help themselves what happened to me. I do not like hospitals and I do not like chemical medicines, but when it comes to especially physical injury, hospitals can help us major way. I do have to admit it and I am glad I went. Many people easy look at the burns (it does not have to be major large burn like mine, but even small ones), but if it gets infected, people can lose their lives. In the United States, approximately 4% of those admitted to a burn center die from their injuries. So please do not easy look at burns. Especially, burn on small children and Elderly people. When burning occur, do not directly put ice on it. make sure to cool it under running water. It is said ice directly on skin can cause more complication. It is best to cool injury with running water for 10 to 15 minutes. then if burning is severe, go to the hospital. If burning seems critical, call 911. If burn is small and does not look like it is nothing major, you can stay home and after your wounds is cooled enough, put Vaseline or natural moisturizer and cover wounds with sterile gauze bandage to protect it. Burn can be in three major stages. First Degree Burn : First degree is the least serious burn that Involves only the outermost layer of your skin, called your epidermis. Your skin will likely be reddened and painful. It can also be swollen. Second Degree Burn : Involves the outermost and second layer of your skin (called your hypodermis). In this type of burn, your skin will be extremely red with a spotted or blotchy appearance, and you will probably have blisters in the area of the burn.A second-degree burn typically causes severe pain and swelling. Do NOT pop blisters as it is protecting our skin from infection. Let it pop itself. Third Degree Burn: Involves all layers of your skin, and possibly structures that are below your skin as well. Some areas of a third-degree burn are often charred black or white. You may experience severe pain, but if a nerve has been damaged by the burn, it is possible that you will feel little to no pain. At this stage, regardless the size of your burn, it is considered serious burn and requires immediate emergency medical care. My burn was second degree burn. However, I had no pain once it is cooled and five days later today, I still hardly have pain. I feel completely normal except my leg looked horrible. I had burn about 1ft in length. and a few major large size blisters and dark red all around it. It is just interesting to think how bad it looks but hardly no pain. Every person have different burn experience and story. As I was searching about burns, it helped me a lot to read about many people’s personal experience of the burn. So I would like to share a little of my story and knowledge about burn injury. Everyday, at our own home, work, anywhere we use something that can cause burn. Please do not easy look at them and be careful when you handle heat. It can be very serious. I cannot imagine my burn on my child, so especially household with small children, be careful and be aware! As common as it is, that means we need to be more careful so it can be less common. Protect ourselves and protect love ones injured from everyday house hold items!